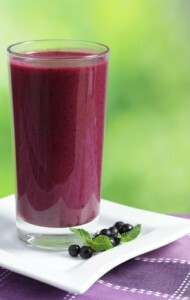 Blueberry and pomegranate are a winning smoothie combination. There’s a reason you hear a lot about their health benefits in the news. Both contain a plethora of vitamins and nutrients, but are best known for their abundance of antioxidants. I’ve focused on the wonderful health supporting benefits of blueberries in other recipes; so let’s delve into why pomegranates are so good for you. The recipe below calls for pomegranate juice, organic if you can, but you could just as easily use pomegranate seeds. If you go with the latter, make sure to blend a little longer than normal unless you like chewing on little pomegranate seeds. Enjoy! Try this smoothie? Please leave a comment below and tell me all about it. Happy Blending! This was fantastic. I threw in a handful of organic spinach too and didn’t taste the difference! Hey Scott! Glad you enjoyed the smoothie. Turning it “green” with spinach is a nice touch. Your comment just made my day :) Love all the add-ons you incorporated to take this smoothie to the next level. Could I add cilantro to this smoothie? Could i use fresh pomegranete avrils instead of juice please? Sure, you can use fresh pomegranate instead, Hazel. Hey, this sounds great but about how many mL does this make?